The "support students Celebration" Work? WHO should participate? Everyone Is Invited! By all of us teaming up together, we can show Montana students that their dreams are possible, and they are not alone. We support them! Do you support them? If so, join this Montana Celebration and show your spirit today! WHEN should you show your support? Join us this September! During the month of September, there will be three weeks of celebrations in Eastern, Central, and Western Montana. During the week of your area college fair, we ask that you show your support by giving a $1.00 to the student scholarship fund, by posting your support on Facebook and/or online, and /or by wearing your college gear to show students your support of them and higher education. It is that simple! The "Support Students Celebration" in September? ﻿﻿﻿﻿We have all been students at one time or another. We know the value of education for students' futures. We know the importance of educated citizens for Montana and beyond. This is one way to help students in this journey and to help students reach their dreams after high school. How can YOU help spread the word, show your support, and join the celebration? 1. ​By wearing your College Gear in September around your area College Fair time. 4. By sharing the College Pride Logos on your website. 5. ﻿﻿By donating a $1.00 to the student scholarships to help a student pay for college. 6. By simply telling your neighbor who is high school about the upcoming Montana College Fair, so they are reminded of the importance to attend and seek options after high school. 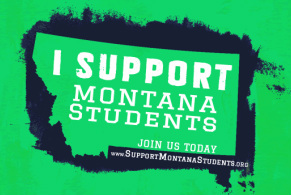 By all of us teaming up together, we can show Montana students that their dreams are possible, and they are not alone. We support them! Do you support them? If so, join this "Support Students Celebration" today!